Designed by Gianni Caproni and Dino Giuliani, this six-engine biplane was the largest landplane in the world. 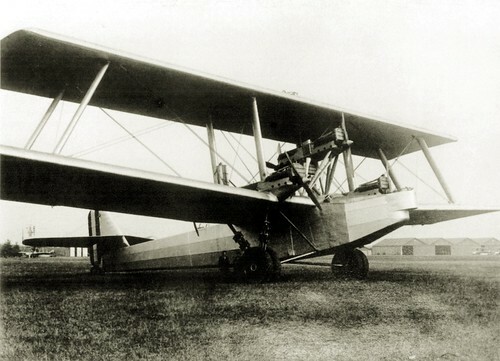 The Caproni Ca.90 made its maiden flight on October 13, 1929 - two weeks before the 7th anniversary of Fascist takeover. It had an unusual layout, with two tandem pairs of 1,000hp Isotta Fraschini Asso engines above the 46.6 m (153 ft) lower wing and one more pair mounted above the fuselage. Upper wing had a span of 34.90 m (114 ft 6 in). Its dimensions are roughly comparable to those of the German WWI R-planes, save the height: the Caproni was significantly taller, 10.80 m (35 ft 5 in) against Zeppelin-Staaken R.VI's 6.3 m (20 ft 8 in). Add to this 15 ft of extra length. Impressive, uh? 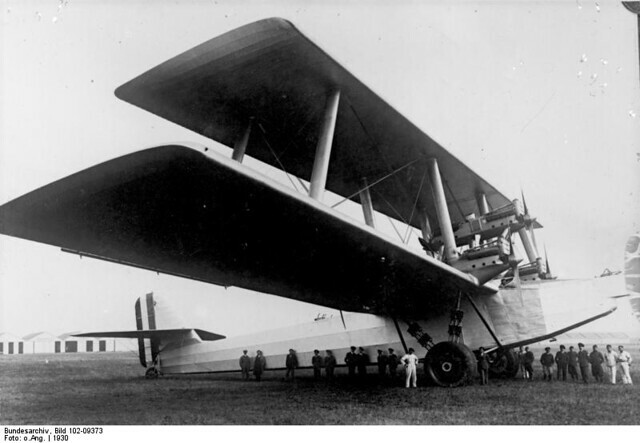 The giant airplane was not just another Caproni folly, but a purpose-built heavy bomber, an embodiment of then-fashionable Douhet doctrine. Giulio Douhet, an Italian general, envisioned a fleet of "flying dreadnoughts" capable of destroying enemy "vital centers". So the C.90 was designed to carry a load of 8,000 kg bombs - enough to bring substantial damage to Toulon, Alexandria or Gibraltar. On the other hand, its range (with full load) - 1,290 km / 802 mi - was not sufficient to attack these targets and return home. And some important targets were still out of reach (for example, the distance between Napoli and Gibraltar is 1779.93 km / 1106 miles, one way). The six-engine monster boasted only a mediocre top speed - 205 km/h. Besides, the Caproni superbomber was a disaster from the aerodynamical point of view. Record of the largest load transported to a height of 2,000 m. : Italy. Cav. 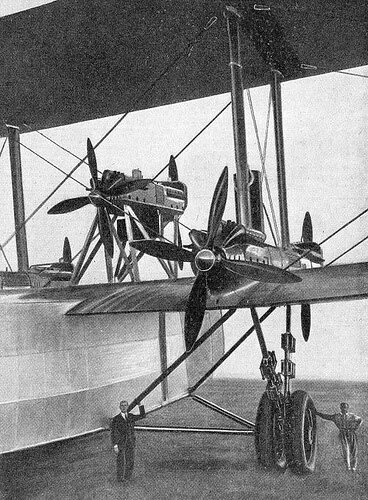 Domenico Antonini, on biplane Caproni "Ca 90" six engines, Isotta-Fraschini Asso, 1,000 h.p., at Cascina Malpensa, on February 22, 1930, 10,000 kg. There was nothing to modernize, nothing to improve - the C.90, obsolete before it started to fly, remained a sole prototype. Until 1934, it served with 62nd Experimental Heavy Bomber Squadron (I wonder if there were other experimental heavy bombers in this unit), and then was written off and scrapped. 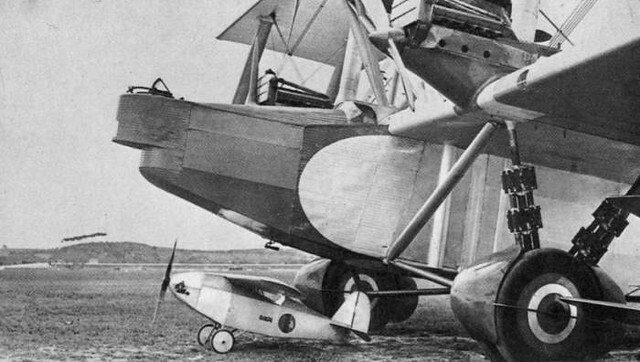 The Ca.90 took the title of the world's largest landplane from the Junkers G38 and lost it to the Tupolev ANT-20. But it will remain in history as the largest biplane ever built and flown. Visually impressive, but ultimately barely able to fly...rather symbolic of the regime itself, I dare say! Good find, lord_k! The pleasure, as always, is all mine.